Welcome to Brand Interiors...Famous high street furniture at half the high street price. If you love designer furniture and interior accessories but find the prices are a little out of reach, we bring them that bit closer. Specialising in discount designer homewares and furniture, at Brand Interiors you'll find a huge range of products from some of the UK's biggest brands at up to half the usual retail price - so you get the same high-end quality at a fraction of the high street price. One of the biggest draws for Brand Interiors customers is the simplicity of shopping. Pick up fantastic deals on dining suites, beautiful beds and interior styling all in a couple of clicks. 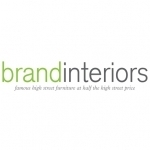 Shopping online at brandinteriors.co.uk is easy and secure, with UK-wide delivery direct to your door. What's more, Brand Interiors also has eight physical stores across the UK. Here you'll find designer furniture experts, helpful advice and more quality furniture and furnishing than you could imagine. In store you'll also enjoy regular, great-value sales and in store specials no bargain hunter could resist! Established in 2008, Brand Interiors has grown from a modest team of four to be one of the UK's leading discount designer furniture specialists. Our products portfolio has increased significantly, so today we source first-class furnishings from a diverse range of designers and bring them direct to Brand Interiors customers. The beauty of Brand Interiors is that you can furnish your home from top to bottom with the wide choice of products on offer. Browse everything from stunning bedroom furniture, quality soft furnishings and children's homewares to designer crockery and solid furniture. Discover designer products, without the designer price tag - online or in store.